Plus size retro reproduction boutique Graciously Voluptuous popped up on Princes Avenue a few months ago. But at that point in my life I was burdened with deadlines and a very tight student budget, so didn't tempt myself by entering. Nevertheless, now I've got a little bit of spare cash, as well as a lot more free time, I thought I'd pop in and have a gander. Gracie and I got chatting and I was in my element discussing all things retro as well as the issue of body confidence and the word 'plus size'. 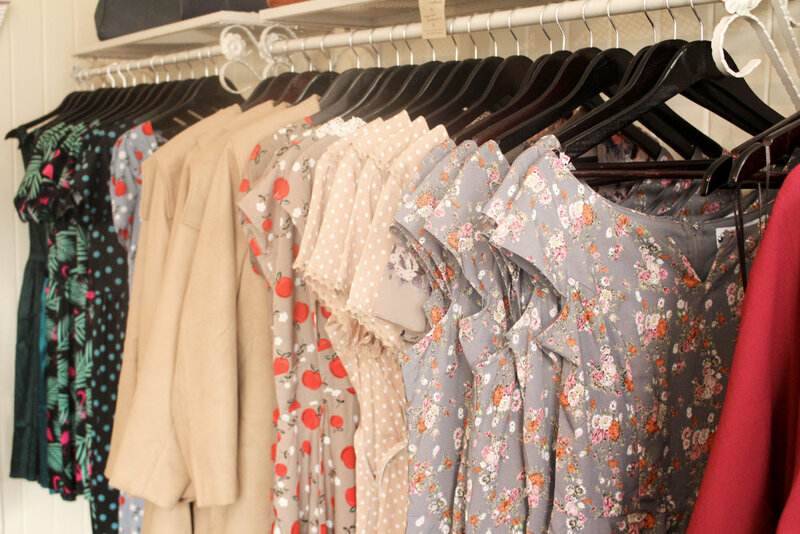 The boutique stocks gorgeous patterns and vintage-inspired cuts in sizes 8 - 26, with a larger focus on plus size pieces. The dresses are absolutely stunning to say the least, and right up my alley when it comes to retro reproduction. Gracie orders in a variety of brands including one of my all time favourites Hell Bunny, as well as ones I'd love to try like Collectif and Lady V London. She's also just ordered in pieces from Voodoo Vixen and Banded Apparel, which are extremely cute and festive. "I want to provide ladies of all shapes and sizes with something a little different," Gracie exclaims, "Although the fact that more high street chains are bringing out plus size ranges, these pieces are not specifically designed for curvier women." As no stranger to body confidence issues, I can definitely relate when she tells me that retro inspired fashions are designed to flatter curves and are great for plus size women. One of the reasons I am so drawn to 1950s fashion is because I love the way it makes me feel and look. We both laugh when we admit that we'd love to try styles from the 60s and 70s or maybe even the 40s, but unfortunately neither of us feel that we would completely suit it. "It's about discovering what suits you," Gracie explains, and I completely agree. Whilst vintage fashion can end up like you looking a bit frumpy at times, once you find what shapes and cuts suit you, you'll keep coming back for more. Personally, I love a chunky cardigan but I'm fully aware that a circle skirt dress with a sweetheart neckline makes me look a hell of a lot better! Gracie also shares my passion for the history behind the fashion. Why did women used to dress that way and what historical events indicated what we wore and how we wore it. "Fashion is so important to me, it's the history of the clothes that make it so special," admits Gracie. Graciously Voluptuous is open Tuesdays through to Saturdays from 10:30am to 5pm. Pop in and try on a frock - and let me know how it went!